How to Use Who and Whom Correctly in Your Sentences? Using who and whom is common misunderstanding with ESL learners which one to use in a sentence. In this article we will elaborate how to use who and whom in your sentences. How to Use Who and Whom? Who: Who is in the subjective case and is used as the subject of a verb. Whom: Whom is in the objective case and is used as the direct objective of a verb or as the object of a preposition. (Who/ whom) is your favorite athlete? (Who/ whom) did you invite to the party? How to use Who and Whom as Relative Form? In order to determine which pronoun to use again look for the verb of the sentence and what is the subject of that verb. She is the one (who/whom) painted that picture. In the sentence above “panted” is the verb and “who” is the subject of the sentence. She is the one who painted the picture. She is the one (who/whom) I love. The verb of the sentence is “love” and the subject of the verb is “I” and “Whom” is the object of the verb. Choosing the right pronoun in elliptical clauses beginning with “than” or “as”. Elliptical clause: An elliptical clause is a clause from which a few words have been omitted since the clause is understandable without those words. Ahmed is a better dancer than (I/me). Tip: When a pronoun is used in this clause, fill in the omitted words then choose the correct pronoun. If the pronoun is the subject of the omitted verb, use the subjective case. If the pronoun is the object of the omitted verb, use the objective case. Ahmed is a better dancer than I.
Ahmed is a better dancer than I [am]. (We filled the missing words here and “I” is the subject of the verb). My dog barks at my sister as much as (I/ me). My do barks at my sister as much as [he barks at] me. My dog barks at my sister as much as me. Sara danced with him more than (I, me). Sara danced with him more than me ( when man is speaking and when man and woman tensed to dance together). Sara danced with him more than [she danced with] me. Sara danced with him more than I [did]. Review: Fill out the elliptical clause add back to the omitted clause discover which pronoun would be correct with those omitted words and that will tell you what pronoun should be in the elliptical clause. When a pronoun is used in a compound subject or a compound object, remember to use the same case as if the subject or object were not compound. (She, Her) and Ali bought a house in Islamabad. Break the sentence into two sentences and choose the pronoun that sounds correct. Break the sentence into two sentences. She bought a house in Islamabad. Ali bought a house in Islamabad. Ali’s father threw a party for Sara and (he, him). Ali’s father threw a party for Sara. Ali’s father threw a party for him. 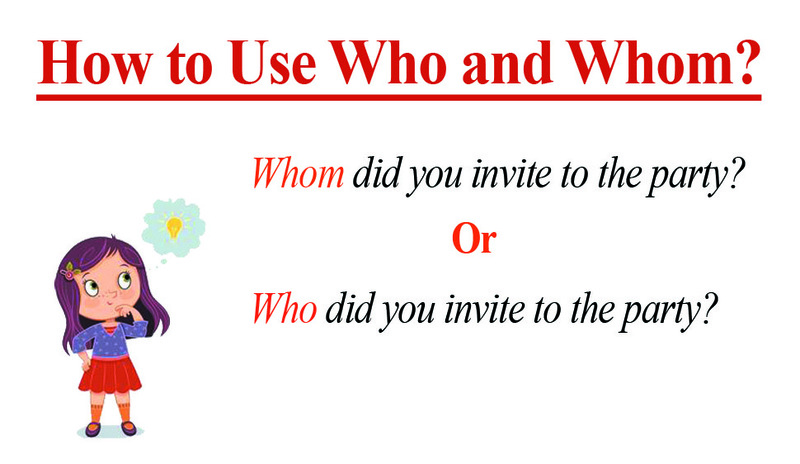 Hope you learned how to use who and whom correctly in your sentences, moreover we tried to discuss other important uses of pronouns which might be beneficial for English learners. Please leave a comment below for more inquiries.